MADISON — The Wisconsin Senate’s top Republican told more than a dozen GOP appointees whom Democratic Gov. Tony Evers fired to return to work Friday, contending that an appeals court ruling this week wiped out the governor’s actions. Despite the appeals court’s stay, most of the laws remain blocked. Another Dane County judge ruled in a separate case Tuesday that key portions of the statues violate the separation of powers between the legislative and executive branches. UW-Eau Claire students Sophie Grupe, left, and Evan Hong enjoyed the mild temperatures, rollerblading and long boarding Friday in Phoenix Park in Eau Claire. Temperatures are likely to be cooler today with a high of 37 degrees. View more photos at LeaderTelegramPhotos.com. 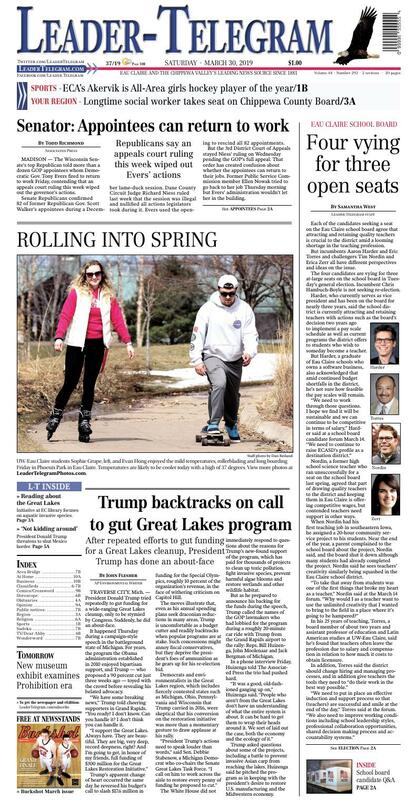 TRAVERSE CITY, Mich. — President Donald Trump tried repeatedly to gut funding for a wide-ranging Great Lakes cleanup, only to be stymied by Congress. Suddenly, he did an about-face. The White House did not immediately respond to questions about the reasons for Trump’s new-found support of the program, which has paid for thousands of projects to clean up toxic pollution, fight invasive species, prevent harmful algae blooms and restore wetlands and other wildlife habitat. But as he prepared to announce his backing for the funds during the speech, Trump called the names of the GOP lawmakers who had lobbied for the program during a roughly 20-minute car ride with Trump from the Grand Rapids airport to the rally: Reps. Bill Huizenga, John Moolenaar and Jack Bergman of Michigan. Each of the candidates seeking a seat on the Eau Claire school board agree that attracting and retaining quality teachers is crucial to the district amid a looming shortage in the teaching profession. But incumbents Aaron Harder and Eric Torres and challengers Tim Nordin and Erica Zerr all have different perspectives and ideas on the issue. The four candidates are vying for three at-large seats on the school board in Tuesday’s general election. Incumbent Chris Hambuch-Boyle is not seeking re-election. Harder, who currently serves as vice president and has been on the board for nearly three years, said the school district is currently attracting and retaining teachers with actions such as the board’s decision two years ago to implement a pay scale schedule as well as current programs the district offers to students who wish to someday become a teacher. But Harder, a graduate of Eau Claire schools who owns a software business, also acknowledged that amid continued budget shortfalls in the district, he’s not sure how feasible the pay scales will remain. Nordin, a former high school science teacher who ran unsuccessfully for a seat on the school board last spring, agreed that part of drawing quality teachers to the district and keeping them in Eau Claire is offering competitive wages, but contended teachers need support in other ways. When Nordin had his first teaching job in southeastern Iowa, he assigned a 20-hour community service project to his students. Near the end of the year, a parent complained to the school board about the project, Nordin said, and the board shut it down although many students had already completed the project. Nordin said he sees teachers’ creativity similarly being squashed in the Eau Claire school district. In his 25 years of teaching, Torres, a board member of about two years and assistant professor of education and Latin American studies at UW-Eau Claire, said he’s found that teachers often leave the profession due to salary and compensation in relation to how much it costs to obtain licensure. Zerr, an early childhood educator at a private Montessori school in Eau Claire and first-time board candidate, said teachers have had “a hard go of it” in the last eight years and agreed that compensation is a large part of why many do not pursue the profession. But if teachers know the district’s environment allows them to be creative leaders, they won’t have a problem, Zerr said. Candidates elected April 2 will serve three-year terms on the board starting this spring. Political experience: Eau Claire school board, 2 years. Education: Bachelor's degree in computer science from UW-Eau Claire. Political experience: Second-time Eau Claire school board candidate. Education: Bachelor of science in physics, Iowa State University; Master of Education, Rutgers University; doctorate in education with focus on policy, Rutgers University. Political experience: Eau Claire school board, two years. Occupation: Associate professor of education at UW-Eau Claire. Education: Ph.D. in Curriculum and Teaching with a specialization in Cultural Studies, University of North Carolina at Greensboro. Occupation: Assistant teacher (ages 3-6) at Saint Edward's Montessori School in Eau Claire. Education: Bachelor of Arts in history, Northern State University; assistant teaching certificate, Association Montessori International Training Center.